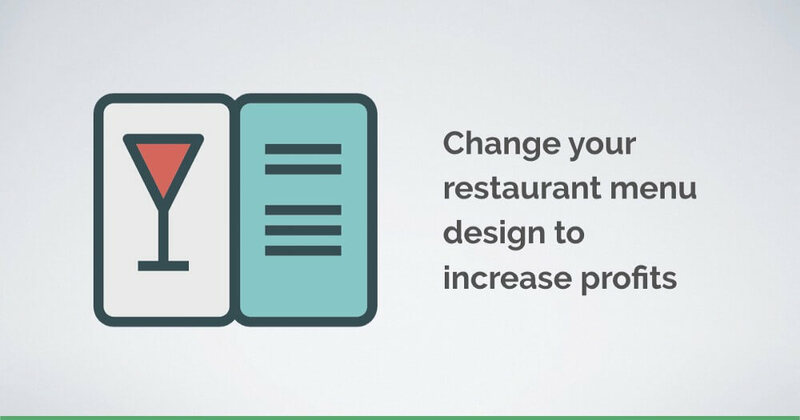 Change your restaurant menu design to increase profits. Can you really improve sales of your restaurant based on the menu card design? The answer is yes. Menu card is the first hands-on impression a customer will have when he visits your store. They believe that the design and quality of the menu reciprocates the quality of food that is served. Here are a few tips to modify your menu and thus improving your profits. Known as charm prices, ending prices with 99 or 95 makes the price look cheaper. Research has shown that people are more inclined towards buying an item that costs Rs. 299 than Rs. 300 because that has a psychological effect on the reader and makes the price look more reasonable. 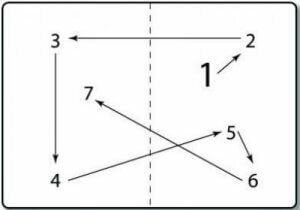 As we read from left to right, we naturally register the first digit that we read and make an immediate conclusion whether the price is reasonable or not. This eye-scan pattern was developed after extensive research on customer’s first impression of a menu card. The upper right part of the menu is considered to be the ‘Sweet Spot’ – the place where a customer’s eye goes first. Restaurants have taken advantage of this to place high profit dishes in this area. Even if the customers who enter your store are hungry or not – reading your menu should make them hungry and crave for food. Think about innovative names for your dishes to make them sound more appealing. There’s higher chance of a customer ordering a dish with a creative name than a normal one. 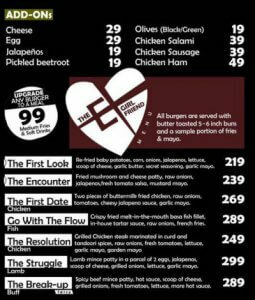 Check out this innovative ‘The Ex- Girlfriend Menu’ from The Serial Griller, Mumbai. Also, this would be your chance to write down a tasty description for your dish. Hire a content writer if you want to and create a 2-3-line description which makes your customer imagine the dish in their head. There’s a high chance of a dish being ordered if the description sounds tasty enough. Keeping the currency symbol on the menu after each price makes the customer look like he’s spending more and more money. If the price is just “199”, the customer may not associate the amount with money and thus less likely to be keeping a track of how much they spend. In a research conducted by Cornell University, they found that people who were given menus with no symbol spent considerably more than those who had menus with symbols or prices written in words. 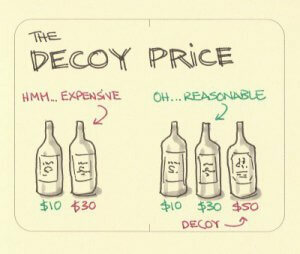 The decoy effect works with pricing of every item in the world. A perfect example would be the picture given below. In the left, two bottles are shown with prices $10 and $30. This might make the $30 bottle to seem expensive when compared to the $10. But, when another $50 bottle is added – this makes the price of the $30 bottle more reasonable when compared to others. If the $30 is our product with high margins, the decoy effect will help in considerably increasing the chances for that product to be bought. We can carry forward this idea to our menu and include a decoy with a high price at the top of the menu to make the other dishes seem reasonable. You may also use the decoy effect for different sizes/portions of the same dish. In the end, no matter how well constructed your restaurant menu is, if your diners feels that they are overpaying for the quality of food they are served, they will not come back again. However, when you get your food done right, the rewards of having a well thought menu makes a large difference. 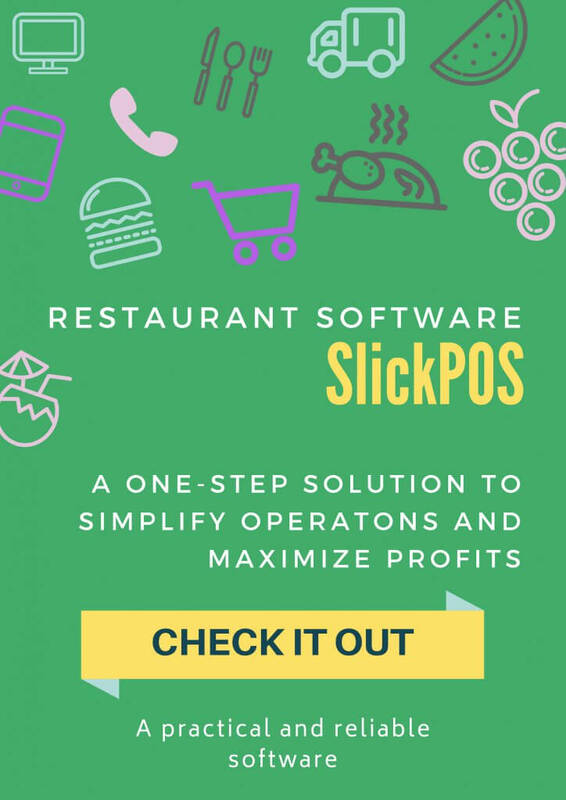 At SlickPOS we keep sharing articles that help restaurants, cafes and food trucks. Keep yourself updated on various trends by following our Facebook page.